Penguins are the most common birds in the Antarctic. Living in colonies with populations larger than some cities, and surviving in the harshest of conditions, it is no wonder that penguins are seen as the emblem of Antarctica. However, of the 17 different species of penguin, only two (emperor and Adélie) make the Antarctic continent their true home, although others (chinstrap, gentoo and macaroni) breed on the northern tip of the Antarctic Peninsula, where conditions are less harsh. King penguins only breed on the warmer more northerly subantarctic islands. One species, the Galapagos penguin, even lives on the equator. The real home of all penguins is the cooler waters of the Southern Hemisphere. Antarctic penguins have a striking black and white coat. The distinctive colours and features of each penguin species are on their heads and neck — some are black and white, some have yellow patches, and others have elaborate coloured eyebrows. All penguins have similar body form and structure, but they vary greatly in size, from the little penguin weighing 1.1kg and about 40cm tall, to the emperor penguin, which weighs up to 40kg and is about 115cm tall. Penguins stand for hours on ice, but they have two clever ways of keeping their feet the right temperature – a few degrees above freezing. Blood flow to their feet is tightly controlled, with reduced flow in cold conditions. Heat exchangers at the top of their legs take heat from the blood flowing to the feet, and use it to heat up the blood flowing back into the body. Where did the name ‘penguin’ come from? No one knows for sure. It could come from the Welsh ‘pen gwyn’, which means ‘white head’, or from the Latin ‘pinguis’, referring to the fat or blubber of the bird. The name penguin was first given to another type of bird, the auk (also a large, flightless, black and white bird). Penguins were once thought to be the most primitive of birds. Members of Captain Scott’s famous expedition went on what they described as “the worst journey in the world” in the Antarctic winter to obtain an emperor penguin embryo to prove this point. But they were wrong — penguins are highly evolved to be able to live in the coldest of places. Fossil records show that penguins evolved from flying birds (petrels) about 50 million years ago. There were at least 25 species, many of which have become extinct. Some fossil penguins were larger than the ones that exist today, with one species almost as tall as a man (170cm). Although they have wings and feathers, penguins cannot fly. Instead, they have evolved into the most efficient swimmers and divers of all birds. Some species spend 75% of their time at sea — the most of any birds. 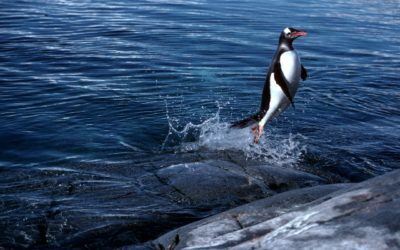 Penguin wings are stiff, short flippers to propel them underwater — they literally fly through the sea. Their legs are set far back in the body, and together with the tail form an underwater rudder to their perfectly streamlined bodies. Their cruising speed in water is about 10km per hour. To catch their breath and to save energy while swimming, they leap clear of the water every few metres. They are excellent divers, descending to depths of over 250 metres, though most of their dives will be in the top 10 metres. Unlike flying birds, their bones are dense to make diving easier. Underwater they are every bit as fearsome to their prey as lions are to theirs! However, penguins are rarely seen underwater, so our main impression of them is confined to how they appear on land. With their legs set far back for efficient movement underwater, the penguins walk awkwardly in a very upright position. This is possibly the reason for their extraordinary appeal — they look like funny little people. Even on land, penguins are surprisingly agile. They can travel vast distances on foot or by ‘tobogganing’, sliding on their bellies over the ice, propelled by their wings and feet. 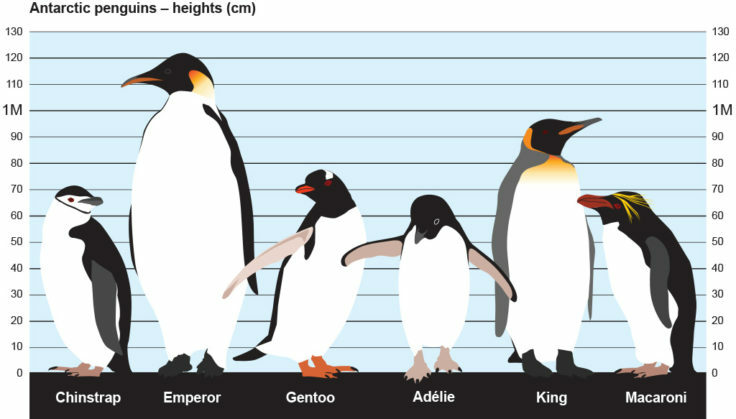 Some penguins are able to hop up great heights compared to their size. Why don’t penguins live in the Arctic? To penguins, swimming in warm seas is like walking around in winter clothes in the height of summer! The warm waters of the equator are a barrier to penguins. Even the penguins living close to the equator stick to the cooler water coming from the south. If penguins could travel to the Arctic, they would find their niche already taken by another bird – the puffin. Puffins are also black and white birds with colourful beaks. However, puffins need to be able to fly to escape land-based predators. Penguins cope well in the cold — some breed in the coldest conditions in the world. Their short outer feathers overlap, like tiles on a roof, to form a thick waterproof layer, and underneath are fluffier feathers for warmth. Like seals and whales, a thick layer of fat under the skin provides insulation (and extra reserves for when food is scarce). As a rule, the larger the penguin, the easier it is to conserve heat. In fact, many penguins are so good at keeping warm that they have a problem with overheating during the summer months. Penguins are sociable creatures both on land and at sea. Their colonies — known as rookeries — are often huge, with up to a million nesting pairs. In the pure Antarctic air, you can smell a penguin rookery from a long way away! Penguins generally breed on exposed rock, beaches or tussock grass, with the exception of the emperor, which breeds on sea-ice. Monitoring a penguin colony involves counting the penguins daily over many months, to find out the timing of events such as egg laying and hatching. With thousands of pairs in a colony, this is not an easy task! When adults return from the sea to feed the chick their diet is analysed. 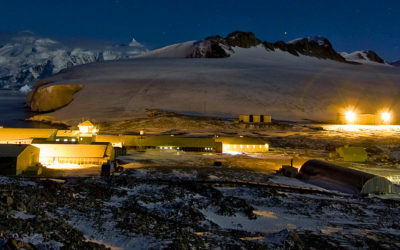 Satellite tracking monitors the location of penguins at sea. All this data is tied in with information about the krill, fish and squid in the nearby waters to build up a picture of how penguins go about their business. The penguin diet consists mainly of fish and squid and crustaceans. In the Antarctic, the smaller penguins mostly feed on shrimp-like krill. Although krill are small (up to 5cm in length) they form dense swarms which are a rich food source. Penguins can adapt their diet to what is available, and their diet varies considerably with season. Electronic dive recorders fitted to the backs of penguins give a picture of their feeding habits, recording the times and depths of their dives. The deepest diving penguins are the kings and emperors as they search for squid and fish — the record holder is a female emperor penguin who reached an astonishing 535 metres. Though the smaller penguins do not reach such depths, for their size their diving performance is just as remarkable. Gentoo penguins dive to 150 metres, and a quarter of their dives exceed 100 metres — in extreme cases they can dive almost continuously for 15 hours, completing over 450 dives. The total number of breeding pairs of penguins in the Antarctic region is estimated to be about 20 million. Although this covers a huge geographical area, the penguins are concentrated in coastal regions. Huddled up in the cold of winter, emperor penguins can reach a density of 19 birds per square metre. The timing of breeding is crucial for penguins. Unlike humans, which can have babies at any time of year, the penguin breeding cycle is finely tuned, so that chicks hatch and are ready to fend for themselves when food is most plentiful. They are very sensitive to environmental conditions. Breeding success is usually controlled by the abundance and availability of prey. If sea-ice does not break away, or krill numbers are low, then huge breeding failures can occur, and few chicks survive. Older birds are the most successful breeders. Most penguins (except the emperor and king) lay more than one egg, usually two. Incubation duties are shared by both parents, working in shifts until the chick hatches, with varying shift lengths from daily changeovers (gentoo) to over a month (emperor).When they are old enough, the chicks gather together in a crèche, watched over by a few adults. This allows both parents to feed at sea, and provides protection from the cold and predators. In 1998, on the island of South Georgia, the gentoo colony had a disastrous breeding year with only 1% of chicks surviving to fledge (40–60% survive in normal years). However, the nearby Macaroni colony had normal levels of breeding success. Both species feed mainly on krill, but in 1998 krill numbers were low. The macaroni penguins were able to change their diet to smaller crustaceans which were still plentiful. The gentoos’ other preferred food, the ice-fish, is also krill dependent, so the gentoos had little to eat. A penguin’s feathers keep it waterproof and warm, and must be well oiled (using oil from a special gland at the base of the tail). Feathers become worn out and must be replaced every year. During the three to four weeks of moulting, penguins come ashore. Because they are no longer waterproof when they lose their feathers and cannot go to sea to feed, penguins fatten up before moulting, gaining an astonishing 50–70% in weight.